Twenty six young singers, actors and dancers from Chiang Mai International School (CMIS) staged the hippie version of St. Matthew’s gospel, in the stage performance of ‘Godspell’ at the Kad Theatre, Kad Suan Kaew on December 3-4. The CMIS students acknowledge the supportive CMIS teachers, friends and parents. Directed by Jonnell Uptin, the musical, which was written by Stephen Schwartz and first performed in London in 1971, was revamped by the students. Rachel Filbeck (Gr. 11) was in charge of costume design; Noah Pollock was sound producer and Sarah Schachtel (Gr. 11) was perfectly cast as the student director. The hippie musical, with 60’s and 70’s music, refers to the last seven days of Jesus Christ and was originally written in English but the student team translated parts of it into Thai so that non-English speakers were able to understand it. This fitted perfectly in CMIS slogan of the year: ‘CMIS gives back’ and showed the enormous potential of these students. Energetic, charming, vigorous, delightful and enthusiastic might be the perfect words to describe the performance of the whole cast and especially that of the very talented actor, Ben Morse (Jesus Christ). The performance was also staged to entertain over 3,000 students from Rangsri Wittaya School in Fang district, on December 6-7 and Chiang Rai Wittayakhom School December 8-9. The comedic parts and the lively music and dance numbers appealed to the older generation as well as youngsters to make the show accessible to a broader audience who showed their appreciation with thunderous applause. Jonnell Uptin, who is now in her seventh year at CMIS, did an outstanding job in getting ‘Godspell’ on the road. The Chiang Mai community can hardly wait for next year’s performance. This holiday I went to Zimbabwe, and for one week of my holiday I went to a national park on the Zambezi River called Mana Pools, which has lots of wild animals and birds. When my dad, my brother, and I got there, we set up camp in a quiet spot. We sat around the campfire and told stories. Dad had told me before that there were hyenas (scavenging animals) which steal your food at night, so my dad said we should put the cold boxes that had our food in them, in the back of the truck with the heavy boxes on top of them, to keep them safe. In the morning we sat around the fire again and my dad told me that in the middle of the night, he heard a loud sound. There was a hyena which had knocked the boxes over, and he had bitten the cold box to try and get in. He did not get anything but a small bag of meat, and my dad showed me the teeth marks in the cold box. The next day we went to the bank of the Zambezi and we fished off the river side for chessa (a river fish). I caught a big one, and then a few medium ones. The next day we went with a guide in canoes on the Zambezi River. We stopped in some places to fish and together we caught loads of fish, the whole keep net was almost full. 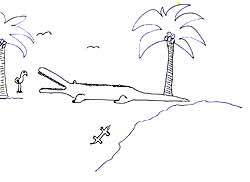 My dad told me that there had been a crocodile accident when some tourists were attacked and one of them was taken under the water and eaten, so I was kind of scared but I got over it. After a long and tiring canoe ride we walked back to the campsite with the keep net full of fish, which weighed a ton! In the morning we packed up and took down the tent, and began the long six hour journey home. Russ is 12 years old, and goes to Prem International School - Grade 7. He is from Zimbabwe. The preceding was a winning entry in the Chiangmai Mail “What did you do on your holiday” contest. The Nakorn Payap International School (NIS) Student Council has started many activities - perhaps the most important being a recognition of doing good for society as a whole. Visiting the slums in the middle of Chiang Mai. On Dec. 5, Father’s Day, the NIS Council went to the Sunday walking street in Chiang Mai to sell charity post cards made by the Agence d’ Informational et de Mediation Pour l’Enfance (AIME), a French organization that helps orphanages in Chiang Mai and Mae Hong Son Provinces. The council was also invited to go to a field trip with the psychology class to see slums in Chiang Mai and to see a school that was established for poor children. While visiting the slums we noticed how bad the conditions were. An organization that started the school for the poor children was originally named for a Taiwanese boy, Shek Man Hin, who was nine years old and dying of leukemia. He received a “make-a-wish” gift to go to Diseyland, but instead gave the money to build a facility for those who don’t have enough money to go to school. Although it was enough to start, the fund paid only enough for 40 students. Today, the center has evolved into the Phonsawan Child Development Center (CDC). Billy and Kathleen Doerner, an American married couple, have now spent 11 years in Thailand trying to keep the school going. The main goal of their program is now to enable these children to go to regular school. Because many of the children are hill tribe they do not have proper documentation to prove their citizenship. 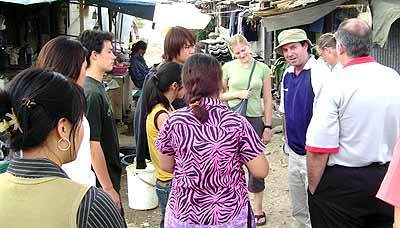 It will be impossible for them to be able to get a proper education and job if they do not know how to speak Thai. To sponsor a child costs only 150 baht per month or 4,000 baht a year. Also, the weather is changing and the temperature has fallen. The children do not have any money to buy enough clothes to protect them from the cold. The teachers and students of NIS have already donated some clothes but it is not nearly enough. Seeing these children has inspired the student council to start raising funds for them. The school principal, John Allen, has advised council with some tips on charity and one of the ideas the student council picked to raise funds was to sponsor a child. This means that the student council will support one child’s school fees for the whole year. Half of any profit made by the student council from its fundraising activities will go to such things. On Dec. 16, the council held a Winter Party New Year’s Charity Project, which included the school’s talent show and a kantoke dinner, games and performances by NIS students. Funds raised from the party will be given to charity. The results of many weeks of work behind the scenes culminated in a wonderful Christmas party at The Pub, for the children cared for by the Rejoice Urban Project. 62 children between 2 (the youngest) and 15 (the oldest), either infected with HIV/AIDS or poor orphaned children who have lost one or both parents to the virus were brought to ‘The Pub’ on Huey Kaew road to enjoy the afternoon. Some of the tireless working ladies who dedicated countless hours to prepare this afternoon for the underprivileged children in the care of Rejoice. 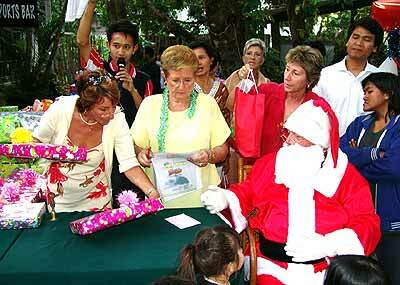 (From R to L behind Santa), Jo Steele, Dot Delaney and Dot Pitcher. With donations from the private sector and the US consulate Chiang Mai, the ladies were busy during the past weeks purchasing soft toys, such as penguins, teddy bears, games, and small toy cars for these unfortunate children. (If a child is infected at birth but then shows no signs of illness in early infancy, he or she may live up to a maximum of 12 years. If sickly from birth, the infected child will normally live to no more than three years of age.) Rejoice Urban Project recognizes that even sick kids need toys too, and their project brings a little added happiness to their short lives. Forgetting their pasts, the children arrived in a happy mood, the clowns were ready to blow up balloons, the food (sponsored by local residents and the Amari Rincome) was enjoyed and happiness was obvious in the garden area of The Pub. This year the community spirit was catching, with many stepping in to help. And it was fun and delight to again watch the children, who forgot that they might not live long enough to see Santa next year. They went home with presents, like other normal children. Many women from the community brought cookies and cakes and helped with drinks, or just to play with the children. The Magic Show was a hit once again, and the eyes of the children lit up, seeing a rabbit coming out of a hat, as did the eyes of the adults, just watching the little ones have a brief period of joy.